With starting running back Leonard Fournette ruled out for his third straight game and limited to just 20 carries this season, the Jacksonville Jaguars have acquired Carlos Hyde from the Cleveland Browns for a fifth-round draft pick. Fournette suffered a hamstring injury in the season opener against the New York Giants and missed the next two games. He aggravated it in Week 4 when he returned to play against the New York Jets. 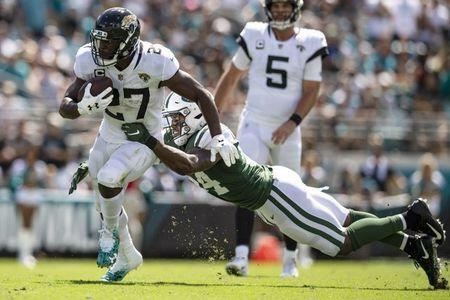 Fournette's backup, T.J. Yeldon, also has been fighting injuries and the Jaguars lost Corey Grant with a foot injury. A product of Ohio State, Hyde was selected by the San Francisco 49ers in the second round of the 2014 NFL Draft. The Browns signed him to a three-year, $15 million contract in the offseason. 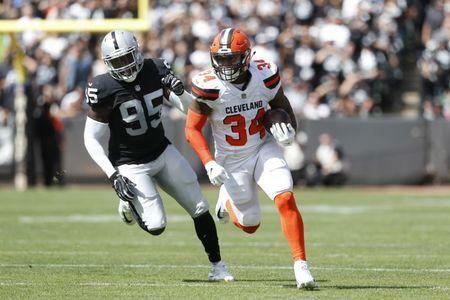 In six games (five starts) with the Browns, Hyde carried the ball 114 times for 382 yards and scored five touchdowns and added six receptions for 29 yards. The trade should mean more playing time for rookie Nick Chubb, a second-round draft pick this year by Cleveland. Chubb, who played college football at Georgia, has carried the ball 16 times for the Browns and gained 173 yards, an average of 10.8 yards per carry. --Oakland Raiders running back Marshawn Lynch is expected to miss at least a month due to a groin injury, NFL Network Insider Ian Rapoport reported. Lynch underwent an MRI exam earlier this week after suffering the injury last Sunday during a loss to the Seattle Seahawks. The Raiders may place the 32-year-old on injured reserve. Lynch has rushed for 376 yards and three touchdowns this season for the Raiders (1-5). Doug Martin will receive a heavier workload in Lynch's absence. He has rushed for 99 yards on 27 carries. --Odell Beckham Jr. said he is ready to do his part to get the New York Giants back on a winning path, but the outspoken wide receiver said he can't do it alone. "I'm ready to talk about the Atlanta Falcons," Beckham said. "I think we're 1-5 and we need to start winning games. "Everybody needs to do more. I need to play better. I can't say that I've had my best games. I can't say I've done enough. ... We win games together, we lose games together." With the Giants at 1-5 entering Monday night's game in Atlanta, Beckham put himself on the spot by flinging arrows at teammates and the offense in general in a wide-ranging ESPN interview last week. Beckham's critique drew the ire of ownership, and John Mara said publicly he needs "less talk, more play" from the newly minted Beckham. On Friday, Beckham said he has not yet talked to Mara and did not confirm he was fined by the team as ESPN reported this week. --The Arizona Cardinals fired offensive coordinator Mike McCoy and promoted quarterbacks coach Byron Leftwich to the play-caller position. The move comes hours after a 45-10 loss to the Denver Broncos on Thursday night, which dropped the Cardinals to 1-6 on the season. The Cardinals are 31st in the league in scoring at 13.1 points per game this season. They were limited to 223 total yards against the Broncos and haven't had more than 269 yards in a game this season. Leftwich, a former first-round pick of the Jacksonville Jaguars, joined the Cardinals as an intern in 2016 under former coach Bruce Arians. He takes up the task of guiding rookie quarterback Josh Rosen and turning the offense around. Rosen had a season-worst five turnovers on Thursday night. His 1.9 QBR on Thursday is the second-worst by any quarterback this season, surpassed only by Bills QB Nathan Peterman's lowly 1.1 rating in Week 1. --Chicago Bears outside linebacker Khalil Mack is listed as questionable because of an injured ankle for the team's showdown against Tom Brady and the New England Patriots this Sunday. Mack, who already has five sacks and four forced fumbles in his first five games with the Bears since his preseason trade from Oakland, was listed as a limited practice participant on the Chicago's injury report after he sat out workouts each of the previous two days. The 27-year-old two-time All-Pro injured his ankle during last week's loss at Miami. --Running back Melvin Gordon was mentioned on the Los Angeles Chargers' injury report with a hamstring injury, but head coach Anthony Lynn downplayed the listing and hinted that Gordon would be on the field Sunday in London against the Tennessee Titans. Gordon, who has rushed for 466 yards and six touchdowns and has 279 yards receiving and three more receiving scores in six games, was limited in practice on Friday. One sign of the Chargers' confidence that Gordon will play: He wasn't given a status designation, such as questionable. Lynn said Gordon's shortened practice was more likely due to symptoms of dehydration rather than the hamstring. --The Washington Redskins listed running back Adrian Peterson as questionable with a shoulder injury, but he is expected to play against the Dallas Cowboys on Sunday. Peterson said he feels much better than he did last week, when he labored through pregame preparations and rushed for 97 yards on 17 carries against the Carolina Panthers. Peterson, who has rushed for 339 yards on the season, also is bothered by a tender ankle. Washington ruled out Jamison Crowder (ankle) for the contest. Fellow receiver Paul Richardson (shoulder, knee) and safety Troy Apke (hamstring) were listed as doubtful. --Rookie running back Royce Freeman sprained his ankle in the Denver Broncos' Thursday night rout of the Cardinals, according to ESPN's Adam Schefter. Freeman, who has started every game for the Broncos this season, left the 45-10 victory after carrying the ball 13 times for 37 yards and a touchdown. He reportedly could miss some time, but the Broncos don't play again until Oct. 28 vs. the Kansas City Chiefs. Freeman, 22, was drafted by the Broncos in the third round of the 2018 draft, 71st overall. 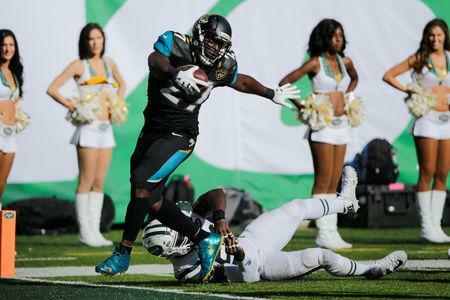 The rookie has rushed 71 times for 309 yards and four touchdowns through his first seven games.